Following a specific religion and practicing the same is entirely the choice of an individual. In the recent times, we have seen in Tamil film industry that Yuvan Shankar Raja had embraced Islam. 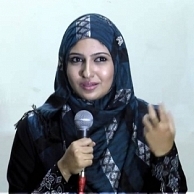 Now, Monika who has featured in films like Azhagi, Muthukku Muthaga, has announced that she has converted to Islam and her name henceforth will be known as Rahima. Monika also explains that she has chosen this path only because she has been inspired by the Islamic principles. She also added that she is quitting films and will be getting married soon to settle down. What's common between K S Ravikumar and Jayam Raja? People looking for online information on Monika, Monika converts to Islam will find this news story useful.